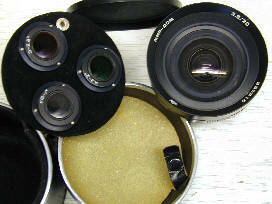 Opposite of the Big Gun, the photosnipers Tair 3 4.5/300mm lens we have the Mir 3.5/20mm Ultra Wide Angle. 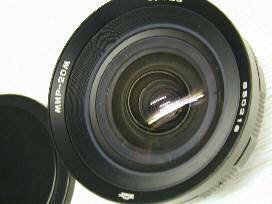 The Mir 20 shares something with the Tair, it is a heavy lens. I also own a 19-35 Cosina (Eos mount) which is a lot lighter. This lens is big and heavy. It is so big that if you mount it on a Zenit-E or Zenit-11 it will interfere with your lightmeter. Mounting it on the Spotmatic is tricky. 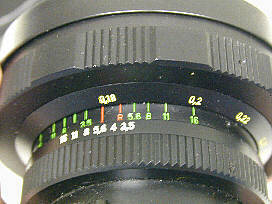 The autoaperturepin interferes with the lever in the camera. 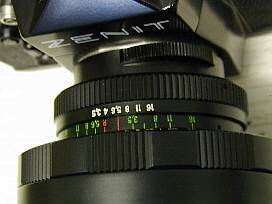 But mounting on a Zenit 12 (which also has autoaperture) or Zenit-E is no problem. It can even be mounted on a Canon Eos with an adapterring. 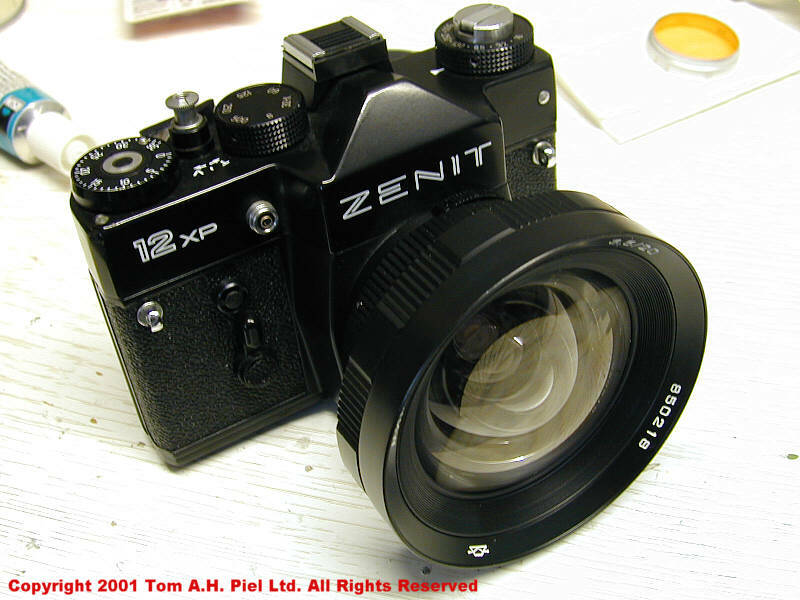 Here it is, mounted on a Zenit-12, which has TTL metering. Look at the size of that lens. 4 shots of the Mir, the box, the caps, the filters. Filters screw into the back of the Mir. This does mean that the frontelement can not be protected with an UV filter. Also there is no place to screw on a lenshood. The Mir is prone to flare, but only if you point it to much towards the sun. And it is big and heavy. These are actually all the bad points of the Mir. So how about its good points? 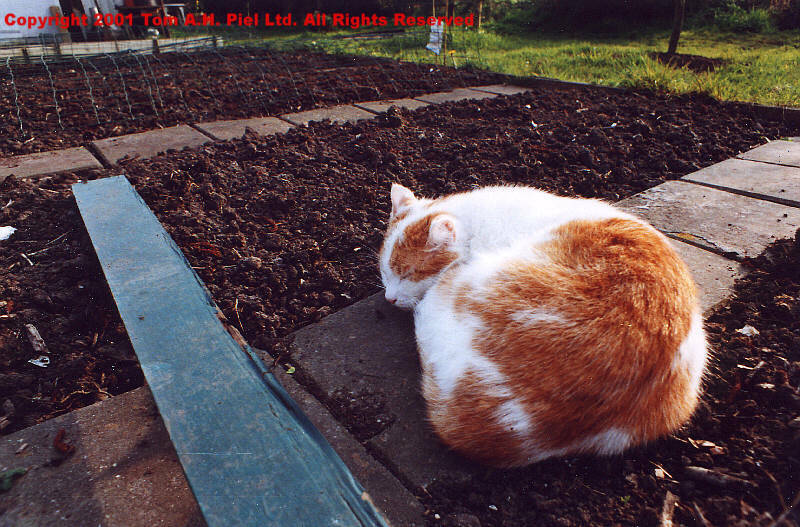 To prove the qualities of the Mir I've scanned in 5 shots made with the M42 version of the Mir 3.5/20mm lens. In all shots a UV filter was used. Shots were made with a Pentax Spotmatic F (which needed to be tested after my handywork ) film used was 100 iso Revue color. Photographic conditions, low sun (shots made in march around six 'o clock) but no clouds. Charlie the cat, being lazy in the garding after dining extensively on rat toujour. 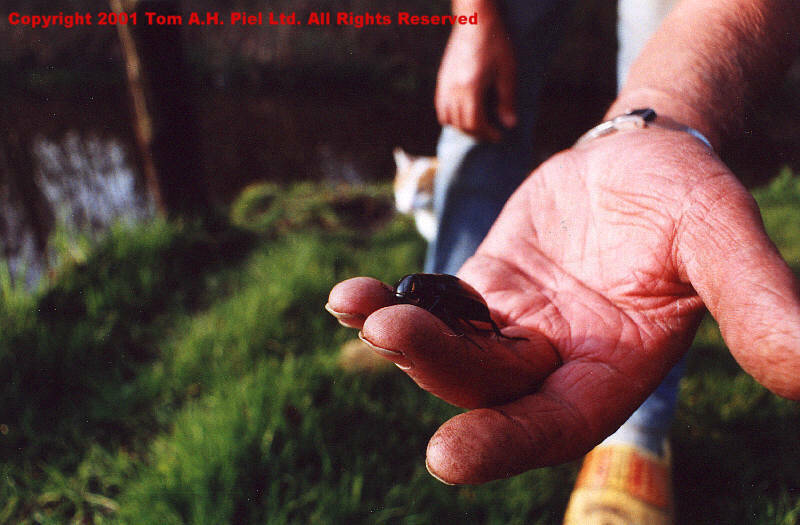 My dad holding a waterbug, shot was made at a distance of about 20 cm, the Mir can focus on less than 20 cm. 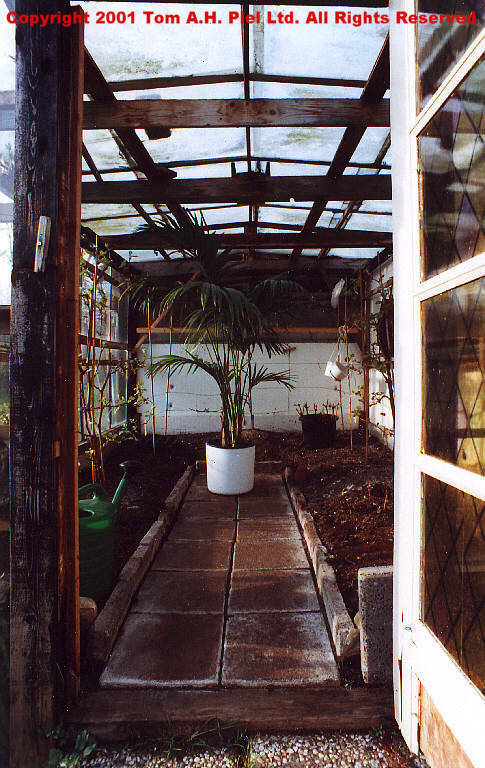 Greenhouse with palm, note that there is little to no distortion on the edges. There is a little distortion but not as much as one would expect. 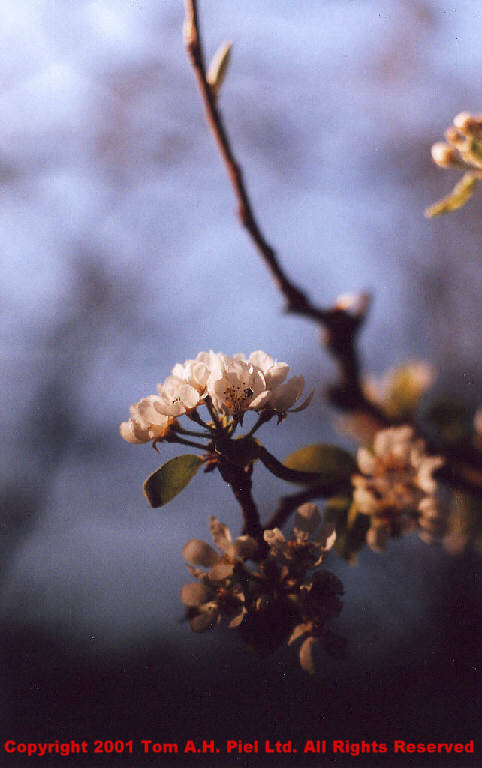 Appleblossom distance around 20 to 30 cm, 1/500 at 3.5 The faded black bottom is caused by another branch. I have found this a great lens to work with, then again I've allways been a sucker for ultra wide angle. Granted that my Cosina 19-35 for Eosmount is a lot lighter. The Mir 20 might be heavy but this just adds to stability. Quality wise the two don't differ all that much but the Mir has better colors. The results of the Mir are great. Well saturated colors, I did use an UV filter but this has no effect on the colors but I haven't taken any shots without the filter. Good contrast, low distortion, this lens is good. If you get the chance to shoot with it, just go for it.